HIROSE has developed the robust ix Industrial™ series of connectors for space-constrained industrial applications that need to support high-speed signal transmission up to 10 Gbps. 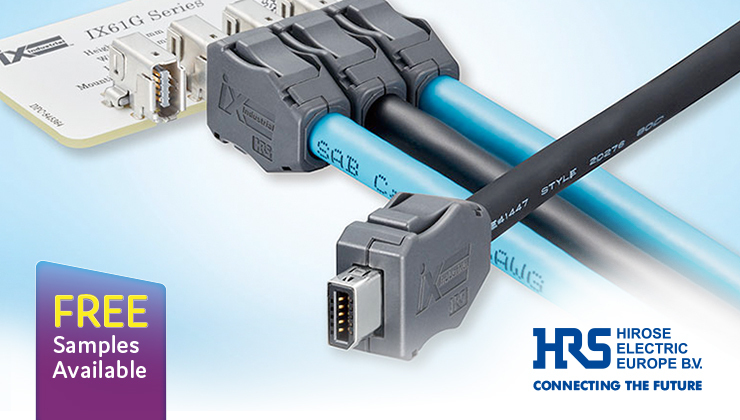 The connectors support CAT5e (1Gbps) and CAT6A (10Gbps) cabling, the ix Industrial™ Series I/O connector also features an optimized EMI/ESD shielding design for safe and secure data transmission up to 10Gbps. 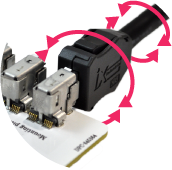 Available with two keying codes for Ethernet and non-Ethernet applications, the ix Industrial™ I/O connector is compliant with IEC/ PAS 61076-3-124. The connector series reduces installation space by up to 75% compared to RJ45 solutions. The receptacle can be mounted in parallel with a pitch distance of only 10mm. The narrow width of the receptacle is particularly beneficial when multiple connectors are positioned on a single PCB side-by-side. Featuring a rugged and reliable design, the snap-in I/O plug connector has a positive metal lock that provides a clear tactile click and ensures complete, secure mating. HIROSE's unique shell design offers a high PCB retention force. High cable pull-out force and wrenching force delivers a durable plug cable connection. The receptacle shell is mounted on the PCB via through-hole solder legs to enhance PCB retention and to resist the wrenching of the cable assembly, protecting the SMT leads. The wire-termination unit and cable clamp are integrated into a single plug shell, which prevents the connecting part of the cable assembly from being affected by the load on the cable. Suitable applications include factory automation controllers, servo amplifiers, industrial robotics, servers, programmable logic controllers, security systems and any other application requiring a compact, reliable high speed connector. Anglia are offering customers FREE samples of the ix Industrial™ series of space saving, high speed industrial connectors from HIROSE, please fill in the form below to register for your FREE samples now.